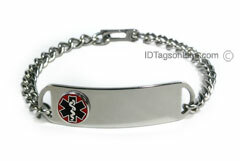 Medical ID Bracelet, IDB39 (size 1-3/4" x 1/2"), is made from non allergic Stainless Steel and is hand polished to the mirror finish. It is guaranteed to be rust free for the life. Raised medical emblem is located on the left side of the plate to allow additional engraving on the front. The enameled medical logo, which is attached to the plate, come in either red, blue or pink colors. We can engrave 4 lines (14 Characters Max. in each line) on the front side and 4 lines (20 Characters Max. in each line) on the backside of personal or medical information on the tag. If you would like to engrave just backside, leave the front side fields empty. Click again on the Source button to reveal the resultant html.